It is a combination 10/100M Ethernet adapter and integrated standard-based 3-port USB hub all in one easy to use device. 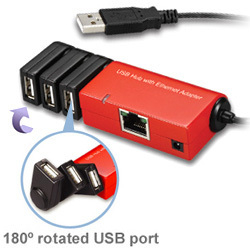 As a fully integrated USB solution, the new USB/Ethernet adapter allows users to easily connect to the Ethernet network with a complete out of the box, Plug-N-Play solution. Operating Systems: Windows® 2000,Windows® XP,Windows Vista® and Windows® 7, Mac® OS X v10.3 or later.